Click on the project's title to be linked to each item or production and further information about them. By Louis P. Burns aka Lugh & Diarmuid McGowan aka Diesel Engine. © Upstate Renegade Productions 2003 / 2007. All rights reserved. Healing Herbs is a medical cannabis / marijuana information film that addresses many of the ailments and illnesses that can be benefitted by regular use of the plant. This entire film was inspired by an episode of the comedy show; The Genetically Modified Mark Thomas Comedy Product. Mark Thomas is a campaigner, comedian, satirist and writer. By Louis P. Burns aka Lugh © 2001 / 2006. All rights reserved. High Velocity is a political poetry video exploring why people become caught up in conflict. It also addresses the repetitive futility of military occupation and war all over the world. High Velocity also draws parallels with Northern Ireland's recent troubled history and the current situation in the Middle East. Louis P. Burns aka Lugh. Diarmuid McGowan aka Diesel Engine. Louis P. Burns aka Lugh interviewed by the RTE Guide 1993. "Shortly after my appearance in the hit Irish soap opera; Glenroe, I got a call from Linda Kavanagh at the RTE Guide who was looking to interview me and find out how the whole thing came about and what I thought of my time with the Glenroe crew and set. I told her about my experiences and the article appeared in their next edition." A collaborative arts and new media production project by Upstate Renegade Productions & Catherine Edmunds © 2006. Excluding the Ben Nevis animation, all art, and poetry in this production by Catherine Edmunds ©. Music performed by Catherine Edmunds. 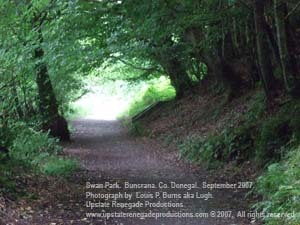 PÓL MCCLAFFERTY (Painter, Photographer and Environmentalist). Pól is a good and much respected friend of both Diarmuid and Lugh at Upstate Renegade Productions. He worked voluntarily on our Healing Herbs medical cannabis film and it is our absolute privilege to display many of his recent photographs of Co. Donegal. All shots were taken in August 2007. By Louis P. Burns aka Lugh © 1988. All rights reserved. A poem by Lugh that celebrates the journey 'inside-out' or self discovery. First written as lyrics to a tune by Andy West, keyboardist and singer in Lugh's band;- Famous Blue Raincoat. Later accepted as a performance poem by many friends. By Louis P. Burns aka Lugh © 2005. All rights reserved. A New Media creative writing and observation on mood through poetry & time-lapse photography. Cool (version 1) by Louis P. Burns aka Lugh ©. All Rights Reserved. This version performed by Aisling Doherty with the Gay McIntyre Jazz Quartet. Cool (version 2) by Louis P. Burns aka Lugh ©. All Rights Reserved. This version performed by Performed by Terence Morrison with the Gay McIntyre Jazz Quartet. By Mark Mc Laughlin aka Sprinkles © 2006. A New Science is a collaborative new arts media production mixing Flash animation, original poetry and audio sampling to create a contemporary artistic experience. Diarmuid McGowan - Diesel Engine. By joining you are confirming you are 18 years old or over. Read the official Sensitize © Guidelines here Any automated application considered spam will be ignored and eventually removed. Why not bookmark us in your Favourites' folder and call again? Best wishes and thank you for visiting.